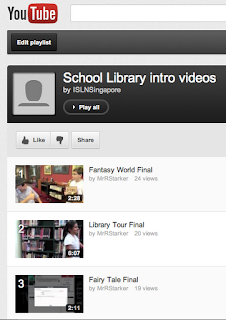 I’ve put links to them on an ISLN YouTube playlist called “School Library intro videos“. The videos introduce basic library organization, genres, and how-to use Destiny/Quest to find books. If anyone else has videos they’ve created and want to share, send me the link and I’ll put them on a playlist. Maybe we’ll be able to have some short videos of Hands on Literacy moments that we can upload after the conference. Just a new place for us to share things we’ve created. Next Post Red Dot SHORTLIST for 2012-2013 — at last…..